Sometimes I notice people flaunting a cookie that is soft and moist on the inside, yet the overall cookie resembles a frisbee- flat and thin and probably equally as aerodynamic as that plastic disc. It may be true, in fact, that such a cookie possesses a moist center, but how much crispiness must one endure to reach such a prized center? And how much saliva can really be drawn from the mouth in the time it takes to sink your teeth through such a pancake cookie? If you blink you may miss the sinking in of the teeth. Now, shortening in the mix will no doubt get the job done. But all butter? Yes, this can be tricky. 1. Extremely chilled dough balls prior to tossing them in the oven. Now, I wouldn’t say these are chewy. As a matter of fact, with very little air whipped in and barely any rise in the dough while baking, I would not select chewy as my adjective. I would, however, dub these tantalizingly tender. And they follow through in their promise of moist and doughy centers. The crispy crunch of the exterior gets swallowed up by the soft and slightly dense centers of cookies and creamy, creamy dough. 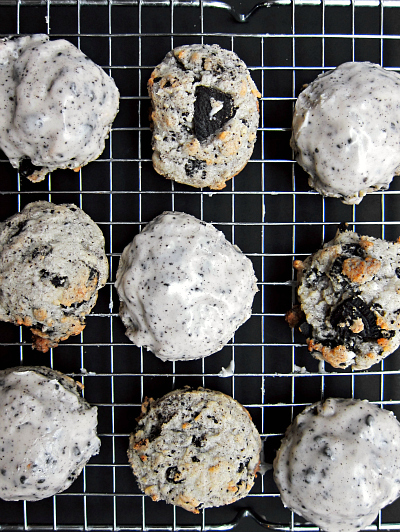 Baked just enough, these rock stars are mountains of white and black with an iced, crunchy exterior protecting a thick, soft filling within. There’s time for several relaxed blinks (and perhaps one exaggerated eye flutter) as your teeth sink slowly through the thick, moist centers. Stack dough balls for a cold cruise before the hot ride. Cocoa cookie crumbs stud vanilla frosting. America’s new favorite chocolate cream cookie. 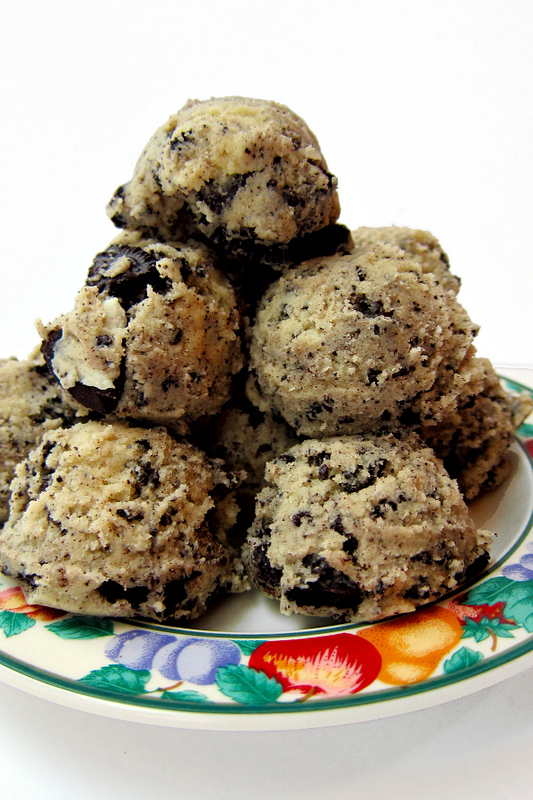 Speckled with deep chocolate and cream cookies, these all butter mounds are packed with satisfaction. A crunchy cookie exterior gives way to a soft and tender center. All of this gets covered in a creamy, thick white icing. Yeah, it’s that good. 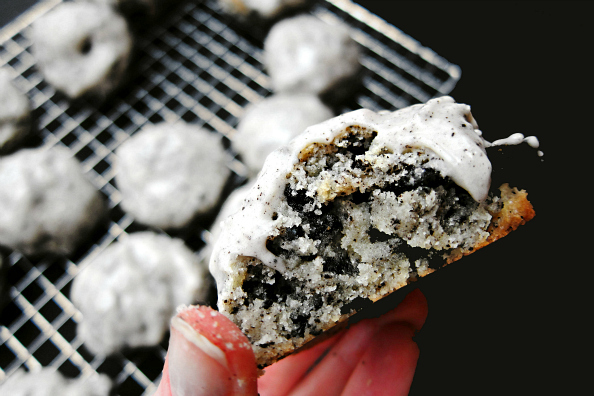 Cookies: Beat the butter and cream cheese with the sugar. Add the vanilla and mix. Then add the egg yolks and mix. Add the flour and salt and stir until combined. Fold in the cookie pieces. Scoop into 1/4 C mounds and place on a plate. Take 8 and put them on a Silpat or parchment lined cookie sheet. Cover the remaining cookies on the plate with plastic wrap and put them in the fridge. Place plastic wrap over the lined cookie sheet with the dough balls and place in the freezer until firm and cold to the touch, but still not frozen. Preheat oven to 375 while dough is chilling. Bake the cold tray of cookies for 13 minutes, until dough is browning, but not until completely golden. You do not want to over bake these. Keep in mind that once removed from the oven the cookies will cool 6 minutes on the cookie sheet before transferring to a cooling rack. This will allow them to continue to cook slightly. Once cookies are cooling and your cookie sheet has returned to room temperature, repeat the process with the remaining dough currently waiting in the fridge. Frosting: Beat the cream cheese and butter together. Add the vanilla and salt and mix. Then add the powdered sugar until thick. Now add the evaporated milk 1 T at a time until desired consistency is reached. 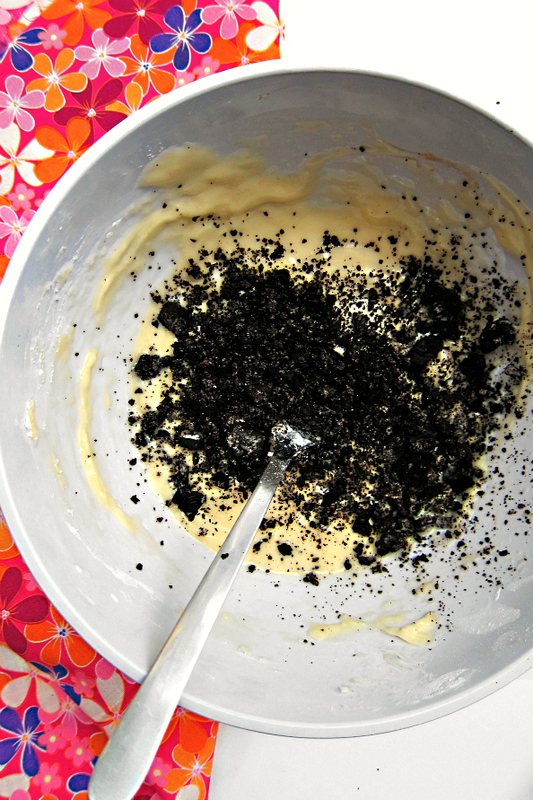 Add more if needed and then fold in cookie crumbs. 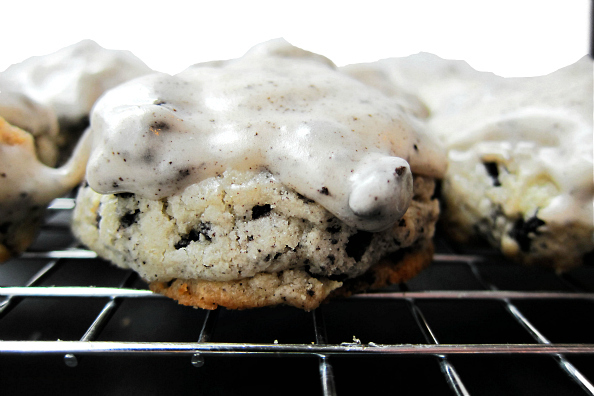 Dip the cooled cookie tops in the icing and allow to harden slightly before serving. Enjoy! 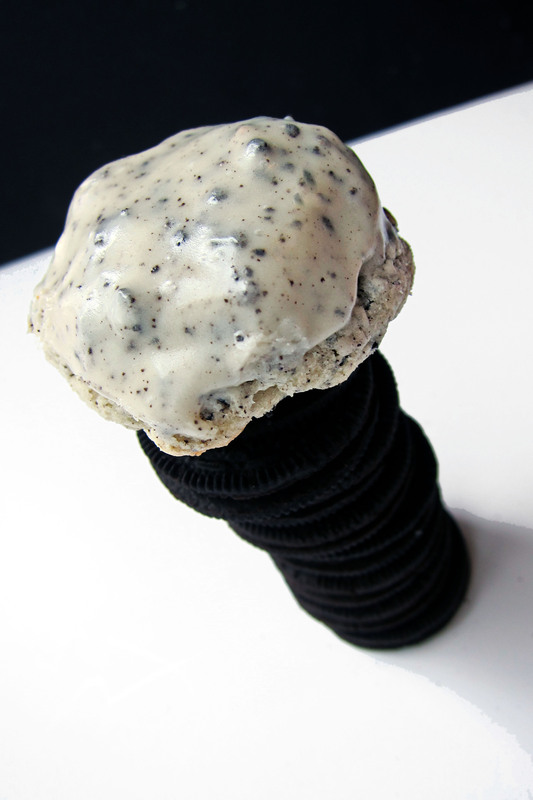 This entry was posted in chocolate, cookie, frosting and tagged cookie, cookies and cream cookie, cookies and cream cookie recipe, oreo, oreo cookie, oreo cookie frosting recipe, oreo cookie recipe, oreo frosting, soft oreo cookie, soft oreo cookie recipe. Bookmark the permalink.